First of all, let me say that I’m sorry for the recent blog issues. I am very frustrated by the current situation and am working on a permanent solution. In the meantime please know that I post Mon-Fri morning and if there isn’t a post when there should be it’s because the server is being bitchy. Thank you to everyone who has taken the time to email me comments and questions – I really appreciate that extra effort! Okay, back to regular blogging. As much as I love summer I can’t deny the feeling of fall that has been in the air lately. And with that feeling comes a renewed focus on being organized and prepared. I’ve started planning meals again and have been cooking things like chicken-and-rice and American Chop Suey rather than things on the grill. I’ve taken Hannah back to school shopping (she started her junior year today – eeek!) and I’ve actually had to close the windows some nights. Fall is definitely coming and that means I need to finish Twist. This sweater has been on the needles since April and my intention has always been to have it finished when the weather turned cool. I had the back and one front of the cardigan mostly done when I set it aside because it was too hot around here to have that thing in my lap but I picked it up last Saturday and I’ve been making steady progress ever since. 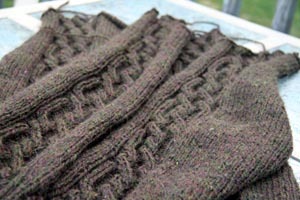 As of last night the back and both fronts are finished and I’ve started a sleeve – woot! The end is in sight! Of course you know that just about the time it’s finished Indian Summer will hit New England. Honestly, though, I’m okay with that! Your sweater will be lovely and you’ll have many opportunities to wear it I’m sure. Hasn’t there been a chill the last couple of nights. It even smelled a bit like fall last night. Twist is looking great! It’s even felt cooler down here (mostly due to Fay). I keep reminding myself that it will be hot again soon. Looks like you’ll be well prepared when the weather turns. Pretty cables! Love how those cables pop! Hope getting bloggy things sorted out isn’t too frustrating. Twist looks gorgeous! Perfect for the cooler weather. Fall has definitely been in the air. Twist is looking great! I know what you mean about that feeling in the air. There have been a few mornings when I was tempted to grab a sweater which is just plain weird in August here. Our humidity has apparently gone missing – not that I mind. Today is the first day that has been fall-like. Twist is going to be fabulous! Oh, wonderful pattern! I’m glad you mentioned the blog issues, because yesterday I couldn’t even get in to see your cute socks or comment and I thought it was me. Hope things clear up soon!! Nice sweater. I always get tired of summer and want to wear sweaters again. 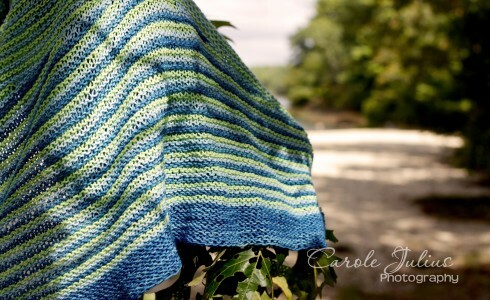 Oooh, I love that pattern and I can’t wait to see yours! 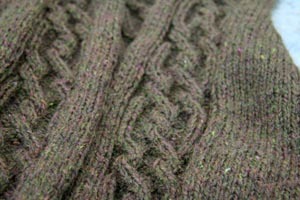 I’ll have to go on Ravelry to see what yarn you’re using cause I like it! I love the pattern, but mine was different. Not nearly as many cables! Yours will look great. hm, okay, so blog issues not just me, I guess – for some reason no pictures are loading. But it could be me. Anyhow, HI! and enjoy your biking!